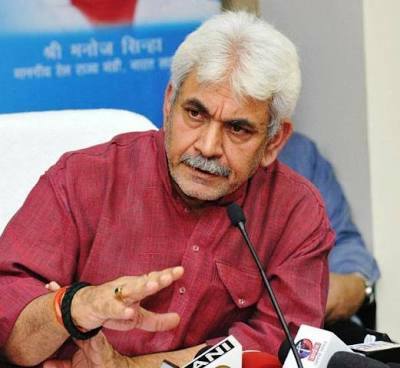 Communications Minister Mr. Manoj Sinha today launched an initiative to increase the number of subscribers of the entire Insurance Village (SBG) scheme and postal life insurance. In the interaction with reporters after launching the scheme here, the Minister said that the idea of ​​Prime Minister Shri Narendra Modi to provide banking services through postal network to provide affordable life insurance services to the people living in the rural areas of the country. needs to be increased. He said that all the villages coming under the MP Gram Yojana will be brought to its extent.The Minister said that under the entire Insurance Village (SBG) scheme, at least one village (minimum of 100 houses) will be marked in every revenue districts of the country. While attempts to cover all the houses of the village identified with at least one RPLI (Rural Postal Life Insurance) of each policy will be made. The primary purpose of this scheme is to cover all the houses of the village identified for the whole insurance village. Mr. Sinha said that under the plan to increase the number of subscribers of Postal Life Insurance (PLI), it has now been decided that the benefits of PLI will not be confined to government and semi government employees only, but it will be done by doctors, engineers, management consultants, Professionals such as chartered accountants, architects, lawyers, bank workers and NSE (National Stock Exchange) and BSE (Bombay Stock Exchange) Area will also be available to employees. This decision has been taken to increase social security coverage and bring the maximum number of people under Postal Life Insurance (PLI). He said that compared to private insurance, the postal policies are lower in insurance and dividend payments. Since the liberalization of insurance sector in the year 2000, there has been considerable change in the insurance industry of the country and the Indian Insurance Regulatory and Development Authority (IRDAI) has been constituted. In such a competitive environment, Post Life Insurance (PLI) / Rural Postal Life Insurance (RPLI) is very important to redefine itself.